In the basement of Winston's Pub, about 30 people are getting settled in, chatting and ordering drinks. Rough beams and exposed brick walls, together with a mishmash of heavy, wooden furniture creates an atmosphere both casual and friendly; the room feels cozy but could easily be spooky with the right lighting. At one end of the room, Julia Boughner is introducing tonight's speaker—a local Environment Canada scientist with a PhD in wildlife toxicology and immunology. The topic: evolution and how it is not part of the science curriculum in Saskatchewan's schools. This is Café Scientifique (or Café Sci), a regular monthly happening in Saskatoon that Boughner co-hosts with colleague Isaac Pratt. 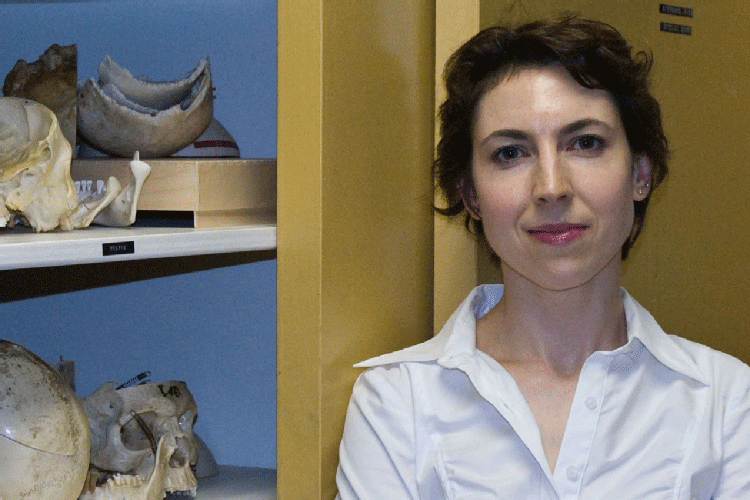 Boughner is an assistant professor in the College of Medicine's Department of Anatomy and Cell Biology. Pratt is a PhD candidate in the same department. This is the second city to which Boughner has introduced Café Sci. While doing post-doctoral research in Vancouver, she read an article in Nature magazine about the Café Sci movement. This was during the George W. Bush era and the U.S. war on Iraq was in full swing. She could see a lot of non-evidence-based decision making, and a general lack of critical thinking. "I thought that Café Sci might help the public become more savvy about the messages we receive from the Powers That Be. Café Sci also sounded like a fun way to provide more and-or new information to people who might not normally engage with science and technology, and an effective way to ‘humanize' scientists to the public," she said. So she and a fellow post-doc decided to organize events. They chose a very populist institution as the venue—the Railway Club in downtown Vancouver—to clearly separate this event from "the Ivory Tower" of a university setting. Their goal was to make science less intimidating and more accessible to everyone, and they hoped to attract a cross-section of people who might not otherwise engage with research. When Boughner moved to Saskatoon to take a faculty position at the U of S and discovered that this city did not have a Café Sci, she decided to instigate one here, too. Café Sci Saskatoon has been running since October 2013. Events are held in the fall and spring months, with breaks in December and over the summer. Topics are diverse and often quirky: bats, parasites, soil, music, mental health, geology, satellites and bioinformatics have all been covered. "I like to think Café Sci is a forum for researchers to ‘soapbox' about their science in fun and personal ways that wouldn't necessarily fly at a keynote conference presentation," she said. The audience on this particular evening is typical for the event: university types and lay-people, with ages ranging from early twenty-somethings to folks in their 60s. At one table, there is a tradesman, a police officer, a writer and a businessman. "I love the diversity," said Boughner, "because it allows many different perspectives and interests to mingle." Generally, between 30 and 50 people attend, depending on the weather. One of the biggest draws was U of S researcher Scott Napper, with his talk Nullius in Verba: The importance of skeptical science and skepticism in science during National Biotech Week in 2014, when more than 70 people squeezed into the room. Boughner believes there is nothing like first-hand explanations of how things work to help people understand a concept. "The fact that the scientist driving the research is standing in the room, soliciting questions, is a huge value," she said. Speakers are also encouraged to "peel back" the curtain on how science is done, and share the quirks, challenges, victories and frustrations of doing research, because some of the most fascinating discoveries have been due to serendipity—by accident, or with unexpected twists. "It might be a fun event in the future to invite scientists to speak about "When Science Goes Wrong," she mused. She thinks other types of events might also be good to increase public encounters with science. "Personally, I'd like to see events that are driven more by public curiosity and less unidirectional in their delivery of information. Maybe something that meshes artistic projects with a scientific approach and scientific content." Boughner said she includes Café Sci on her CV and adds the events to her professional activities report each year, however, it is not part of her job description as a researcher and a teacher. It takes time to organize and host the events but, as she puts it, "it's a hobby and a labour of love." Café Sci Saskatoon schedule and speaker information can be found on Facebook under "Café Scientifique Saskatoon." Jackie Robin is the communications director with Ag-West Bio in Saskatoon.